Dang, seems really good to me. Ok this one actually isn't complete garbage. These portal cards are awesome and I feel much stronger than they seem in a draw heavy deck. Neutral Fal'dorei Strider. Pay +2 mana for a neutral card, +1/2 stats, and rush on your summoned demons but smaller 2/2 bodies instead. If control Rogue will work, with a lack of board clears this card with Rogue's draw ability will be core. I think we have all the pieces for a competitive control Rogue with LEGIT win conditions in either Togwaggle or Tak...add the Contract and it all comes together. arena will like it for sure. Its not strong enough constructed wise for me. Much better than Portal Keeper. The art is fudging awesome tho! Shudderwock synergy ? Shuffle 12 portals into your deck ? After seeing the whole set I think there will be a pretty good warlock deck that uses Plot Twist. And this card and its rare brother wont be a part of that deck. They are understatted "do nothing" minions, and even if you manage to get some dudes with Plot twist, the payoff is not that great. Some synergy with Akali, the Rhino. Neutral demons!! Also some really cool combos with cards that multiple cards you add to your deck, battlecry minions, minions in general etc. Not to mention warlock...... This one is pretty nice. Not really. 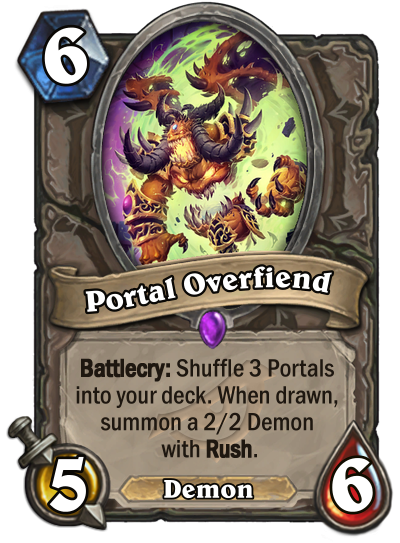 They are portals in your deck, they only become rush minions when you draw the portals. If this minion was an understatted 3-drop, I'd think it was stronger. Being at 6 mana though makes a low tempo play and the occasional 2 damage later just doesn't seem that strong in the late game. Why isn't this a Warlock card??? Cause every class gets maximum of 10 cards and they had more ideas.